One of our biggest promotional efforts over the past few months has been developing a new e-book, titled “A Powerful Pairing: Connecting Content Marketing and Syndication for Enterprise IT Thought Leadership.” When one of our people read it, he said it would make for great summer reading. Whether he was being truthful or just fawning over the boss’s latest project is up for debate. But what I do know is that the summer is a time when many businesspeople decompress at the beach, and grab titles that they’ve seen make waves but haven’t had the time to read. The first book I’d offer you to consider is our e-book, which you can get now for free. I’d also like to recommend several other best picks for beach reading that I’ve shared with colleagues to help them unwind and recharge their batteries. What books are you reading this summer? “The New Digital Age: Reshaping the Future of People, Nations and Business” by Eric Schmidt and Jared Cohen. If you have time to read only a single book this summer on technology and its impact on the world around us, then this is a must-download. Ex-Google CEO Schmidt and his writer and fellow Googler, Jared Cohen, have produced an important, immensely readable manifesto that focuses on the impacts of technology, rather than the mips and bips. In broad, global terms, “The New Digital Age” explains how technology will bring about huge socioeconomic changes, but also how it will impact individuals. Those individuals include not only the wealthy few, but also the poor — tipping balances; affecting change; and redefining how we work, relate, learn, and play. Rich with examples — such as how $20 cell phones will transform the fortunes of Maasai cattle herders, who have no written language, by allowing them to crowd source the location of lions that threaten their herds — it is brilliant in grounding theoretic future telling in concrete case studies to show us opportunity as well as our own blind spots. Take for instance, Anthony Mutua, a 24-year-old Kenyan inventor who will transform the world with an invention that no first-world consumer will ever need or want. Mutua has developed an ultra-thin crystal chip that can generate electricity when worn in the sole of a shoe in order to charge devices. Mutua will level the world by allowing third-world consumers to connect in off-the-grid areas of the world, opening new vistas for them in a way much more impactful than the West’s current notion of breakthroughs, such as Google’s own driverless cars. “The New Digital Age” represents a tour de force of new thinking and boundless opportunity that any IT marketer should read. I highly recommend consuming it in concert with “Blind Spot: Why We Fail to See the Solution Right in Front of Us,” which is reviewed below, as a mind-expanding, one-two punch of shattering limitations and finding new opportunities. For any marketer, and particularly IT marketers, Palmer’s insights into advertising, the real implications of social media, and the emergence of digital thought leaders provide an excellent framework for better understanding the changing nature of our marketing ecosystem. 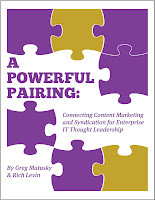 “A Powerful Pairing: Connecting Content Marketing and Syndication for Enterprise IT Thought Leadership.” Full disclosure: This e-book was co-authored by myself and Gregory FCA colleague Rich Levin in order to help clients fully appreciate the power of content when syndicated both online and through traditional media. We wrote the book after realizing how IT marketers were quickly embracing the tenets of content development and self-publishing, but then failing to put it to work by publicizing the content in order to create thought leadership for their subject matter experts. The book starts with the realization that publishing is the new model for marketing IT services and products, and then explains how to effectively build a following by first empathizing with your audiences, understanding the stressors and pressures they face, and addressing them in everything you produce. It then provides a detailed road map for syndicating content with real live examples of how content can be put into action to connect with IT service and product decision makers and buyers. It’s a fast read, and we wouldn’t be presumptuous enough to review our own work. But it’s worth a download. “The Marketing Agency Blueprint: The Handbook for Building Hybrid PR, SEO, Content, Advertising, and Web Firms” by Paul Roetzer. This book could be called “How to Use Hubspot-like Bait-and-Switch Tactics to Build Your Email Marketing Database.” That’s because the book is a little too much of a promotion for Hubspot, the popular inbound marketing platform, and not enough about the convergence of disciplines that define a contemporary agency. While the book’s reviews on Amazon call it out for just this bait and switch, I am still going to give it a strong thumbs up by overlooking the love letter to Hubspot. That’s because Roetzer does a smart job of identifying the key talents needed to effectively market in a digital age, where PR, media, content, SEO, and other disciplines all are converging at break-neck speed. Roetzer does an admirable job of making the case for what the hybrid agency (and by proxy, smart IT professionals) can construct with their own internal resources to source, find, and partner with the right providers. If you are not interested in building an agency, skip the chapters on pricing and staffing and payroll, some of which are pretty simplistic, and instead focus on the broader message of the book — how content and SEO are the new royal couple of effective marketing and how their interplay can enhance your IT marketing effectiveness. “Blind Spot: Why We Fail to See the Solution Right in Front of Us” by Gordon Rugg and Joseph D’Agnese. Why would it be important for IT marketers to understand the real limits of so-called experts and generally accepted wisdom? Mainly because it’s our job to create perceptions, and understanding how perceptions are formed provides a powerful road map for doing our jobs. In “Blind Spot,” authors Rugg and D’Agnese tell the story of how co-author Rugg broke the code on an ancient manuscript thought to have been written in unbreakable encryption. Rugg, a Ph.D. and linguist, determined the text wasn’t unbreakable. Rather it was simply gibberish, a fact that had eluded scholars and experts for years. Rugg and D’Agnese use the incident as a showcase of how we miss the obvious and how we struggle to explain or understand what is often before our very eyes because of how we process perception and the assumptions that stand in our way. The book goes on to provide a toolbox for dealing with difficult problems and sorting out the truth — all good skills for someone working in the highly complex world of IT and trying to communicate it to the world. There you have it. The best for the beach in 2013. Read and re-energize, and return to the game ready to take on the changing world of technology.